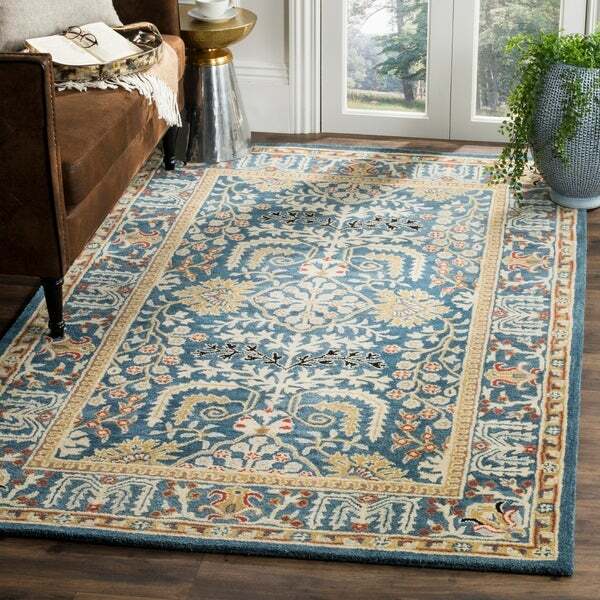 The colors in the rug allows you to pull in a variety of others to coordinate in any room. It’s a different blue, kind of like the ocean. I am glad I took a chance. Beautiful and true to color! Soft blue with lush golden accents along with linen and a splash of burnt sienna. This rug was the foundation of our new design! Beautiful rug. Love the quality and texture of this rug. The only down did is that it sheds. I have vacuumed it several times and each time it fills the canister up. It does seem to shed less the more I vacuum it. Everyone has made such positive comments on my new wool rug. The quality is excellent with its plush pile and array of colors within it to match my furniture and paintings in the room. With new wood floors, I added a dual surface pad which makes it even more soft to walk on. I notice it does shed, but a weekly sweeping with a plastic small bristle broom brings the shedding up to the top for easy removal. It is perfect and I can tell it will last as long as my last wool rug that I paid 3x more in price. No one can beat Overstock prices! This rug is a dream. Rich beautiful colors and design that won't go out of style. Pile size is substantial so it feels good under your feet and won't feel flat or threadbare ever. I would purchase this rug again and am glad I purchased it. Price was great especially to get a wool rug! Wool rugs shed. All of them. The quality and colors matched the description and picture. Have purchased almost every size for my new house. They are perfect and arrived in great shape. Very happy with purchase. The colors of this rug are gorgeous. It gives the room a pop of color without being "loud". Very soft and I've received so many compliments! Purchased this for my front foyer. Initially I was wanting a red rug but I am pleased with the blue. The color is a perfect medium blue as portrayed on web sight. 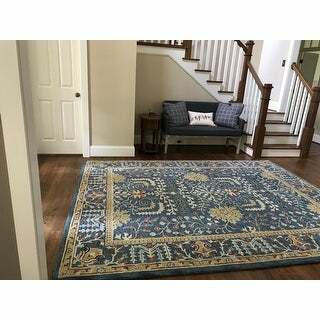 This is a beautiful rug and has looked great in both a living room and dining room. There is a little more salmon color in the rug than the picture reveals. The price of this rug was surprisingly lower than I would have expected. The quality is exceptional and the colors are perfect with my daughter-in-law’s decor. Design is fresh, new and traditional at the same time. It looks great in front of their sofa and fireplace! Not the quality I thought they were! I am more than thrilled with this area rug. It’s colors are rich and true to what is pictured. It has a nice thickness and hasn’t shed at all. I love it! Lovely to look at but sheds a lot!! Looks beautiful, great colors, not shockingly bright yet definitely colorful. Very soft under foot for wool. This rug does shed a little bit, but if you normally clean the house every other week, it's not a problem. A dust buster works great for the occasional fibers that comes loose. Despite the slight shedding, there aren't any patches of missing fibers, so it doesn't effect the overall look, and the fibers are so small, guests wouldn't notice. Great colors. Nice quality. Will be in my home for a very long time. "Please name all of the colors in the rug . What shade of blue?" This rug appears to have blue, red, cream, yellow, orange, brown and black mixed in. Please note that some colors may vary due to dye lot variation from production. Has all the colors I need to complete my room! "What is your return policy "